Not much to say about that. Sales are down significantly YoY, while listings are almost on pace. I'm thinking north of 11 MOI for the month. In other news, the Bank of England poached Mark Carney. I wonder what this means for the Bank of Canada's rate position..
Just over halfway through the business days of the month and we're on-track for about 400 sales, or continued sluggishness. “…Simulations indicate that on average (based on 2010 real mortgage data), the additional down payment required is about $25,000, 7% of the purchase price..... If we assume that these households can devote 10% of their pre-tax incomes to enlarging their down payments, on average it will take 3.5 years to re-qualify"
Looks like this time the hit is larger, and those people knocked to the sidelines will take quite a long time to recover. This is all keeping in mind that this is under best case conditions of continued low interest rates and an optimistic savings rate. Big jump in active listings from last week. Not sure how that works exactly, since last week there were 207 new listings added to 4397 active listings which adds up to 4604. And yet we have 4648? Some BOMs would add to that number, but what about all the properties that went off market in the last week? We're on track for 350-420 sales this month depending on how you project. Another month of sky high MOI for sure. 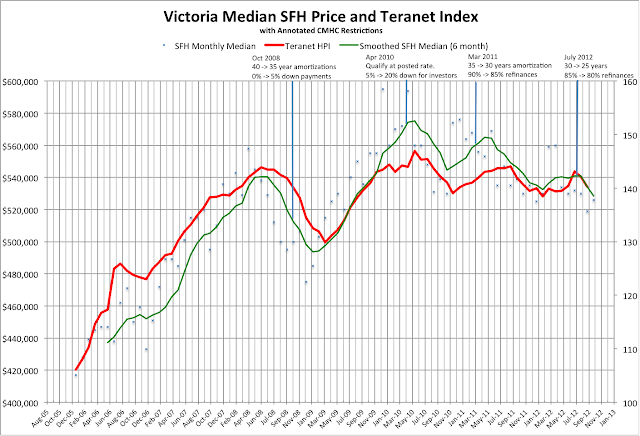 Another month, another deterioration in market conditions in Victoria. It's so boring out there that we were reduced to arguing about Alberta for the week. From our previous year of inventory, we have advanced even further to 13.1 MOI for the entire region. The only other time in VREB recorded history that we've had higher MOI was in fall of 2008 when everyone was convinced that we were heading into another great depression. 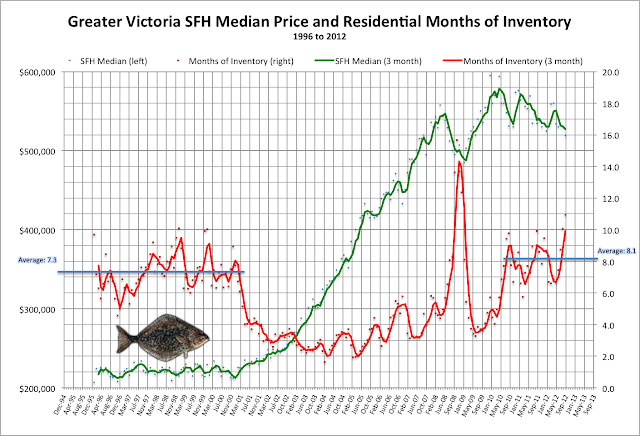 That October our MOI was 14.8 and prices were dropping. Of course this is for the overall market, and Just Jack quite rightly points out that the MOI varies significantly between regions. 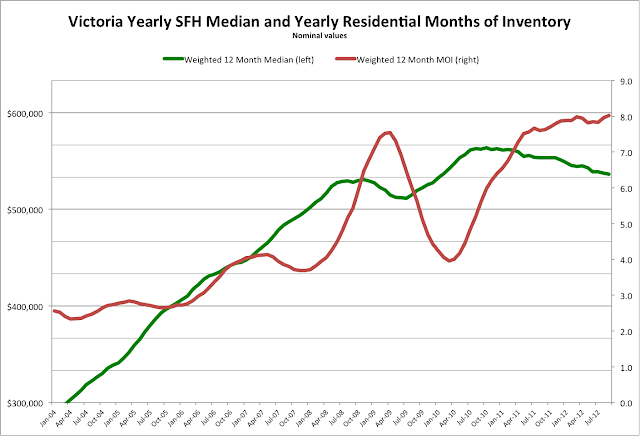 Especially for single family houses in the core, the MOI is still within the range of a balanced market. The VREB has placed the blame for the slowdown firmly in the lap of the feds, which is certainly an improvement over blaming the weather. If true, we should see sales recover around Jan to April as the market adjusts. Both the VREB and Just Jack show us how even hard facts aren't quite as facty as one would expect. 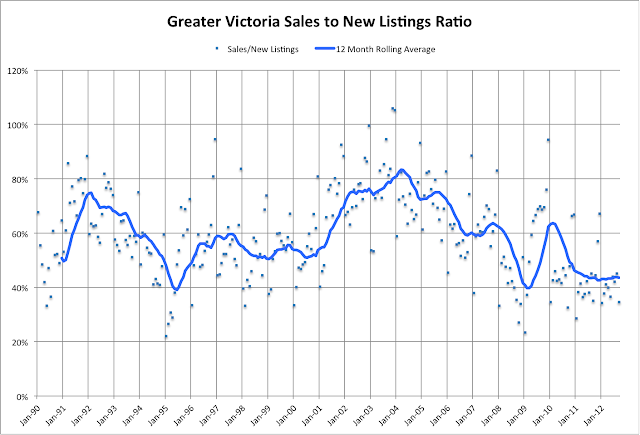 Reported sales for the month don't seem to line up to actual sales from the 1st to the 31st, and the VREB shows us that the average price for 6 manufactured sales is apparently negative $122,417*. Another reason never to pay attention to single months numbers. The VREB will be tough pressed to produce 400 sales for the month of October... but I have faith they can work magic with numbers and pull it off! These are challenging times to be trying to sell a house. That's all I have to say about that. But first, kudos to new poster lolatengo for pointing out that the sales/new listings ratio was incorrectly stated in the last update. The sales/new list in the second week dropped from 38% to 34%. This is actually highly unusual, since sales/new listings generally starts off low and increases throughout the month (since the beginning of the month brings a flood of relists). Have we ever had a decrease from the first to second week of a month? The houses in our price range still weren't quite what we would want to live in for the long term (15+ years). Hard to swallow dropping half a million on a place and still needing to spend tens of thousands on repairs with the associated disruption/stress. Market is increasingly weak, so the chances of it being advantageous to wait are high. According to Roger's rent vs buy calculator, if it stays flat, we break approximately even and can afford a better place in a year. If it declines we save whatever the decline was. Of course one thing to consider is how long the correction will last. A common argument is that timing the market is impossible, and if you wait too long you'll miss the chance and have to buy when the market is recovering and competition is fierce. So what about past corrections? 90s - 5.5 years from peak to trough, during which time conditions were favourable for buyers with lots of selection. It took 7.5 years for nominal prices to regain their previous peak. 80s - The decline was cliff-like and lasted 4 years. Again it took 7 years for nominal prices to regain their peak (11 until real prices caught up!). 70s - 4 year peak to trough until the bubble of the 80s started. Our peak was in early 2010, so I think we can safely assume that our correction has at least 2 more years, and likely more after that. I'm not worried about missing the boat anytime soon. (By the way, for those who like to look at prices as flat since mid 2007, and thus would define our correction as already 5 years old, by that measure the 90s correction was over 8 years long). As for timing the exact bottom, it certainly doesn't seem like there the MOI will give us any sort of predictable head's up. When the market decides to recover, MOI falls off a cliff and prices start rising. It is likely much more useful to look at affordability measures to gauge approximately how much longer a correction will continue for. 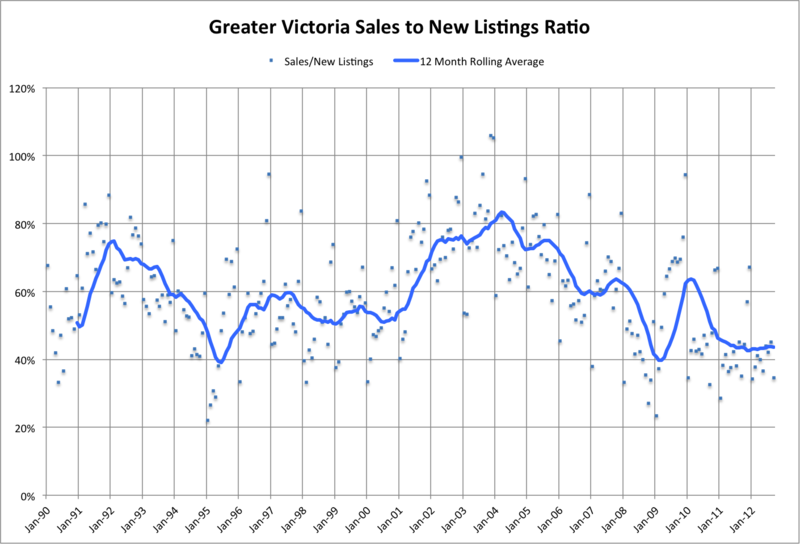 Extra graph: Sales to new listings ratio from 1990 to 2012. Note that in the last 2 years we've seen the lowest sustained sales/new listings ratio in 20 years. Crazy extrapolation: More people than ever are listing but not able to sell. We're building up pent up selling demand. 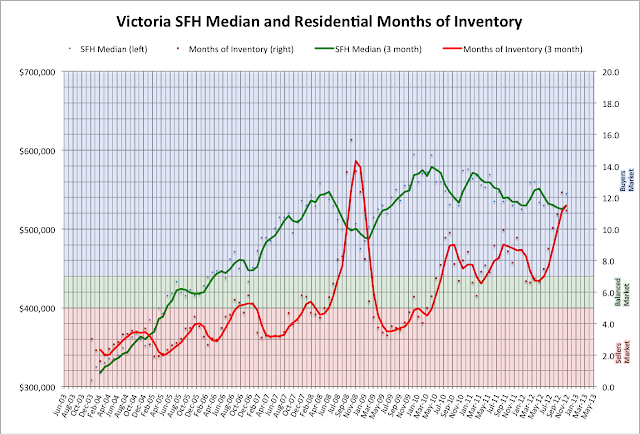 One of the best measures of current demand out there is the months of inventory (MOI). This expresses the number of months it would take to sell all active listings at the current monthly sales rate. So in September we had 419 sales with 5025 active listings, giving a MOI of 5025/419 = 12 months. 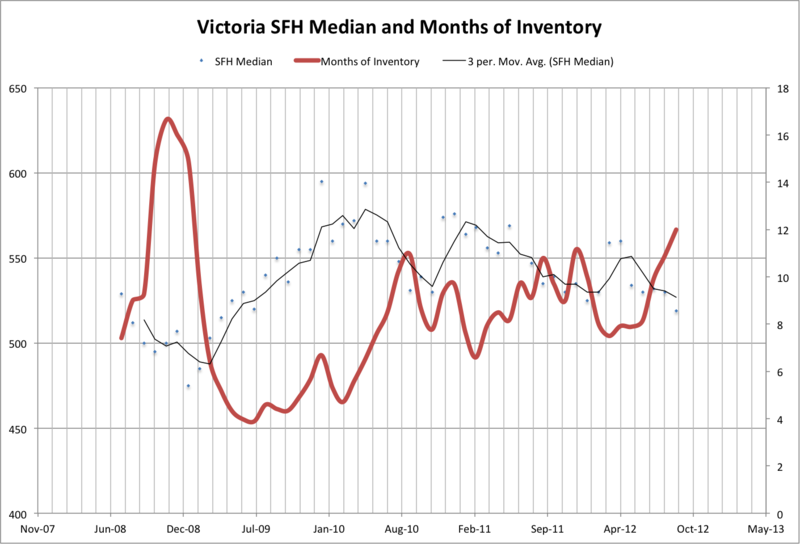 It’s widely agreed that when inventory levels fall between 5 & 7 months, that the market will be considered balanced. 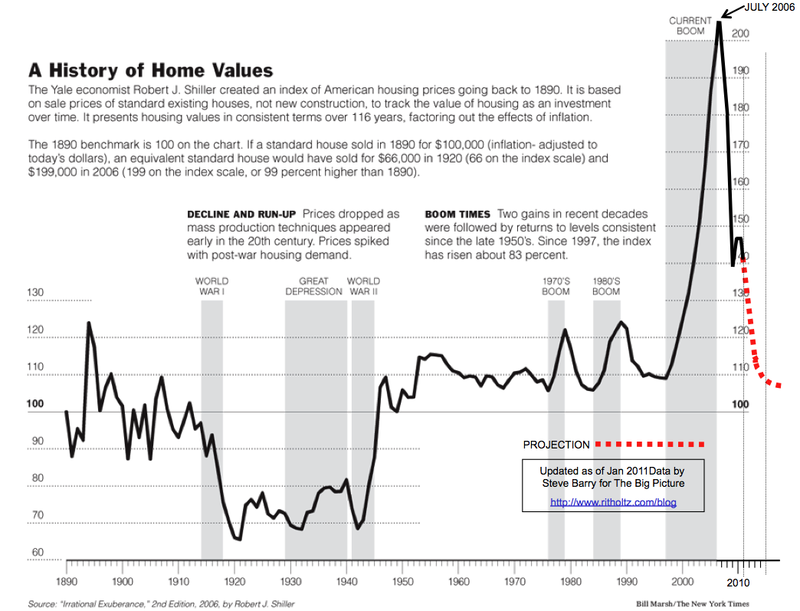 Housing prices should be stable, perhaps rising slightly, influenced more by inflation than by demand. 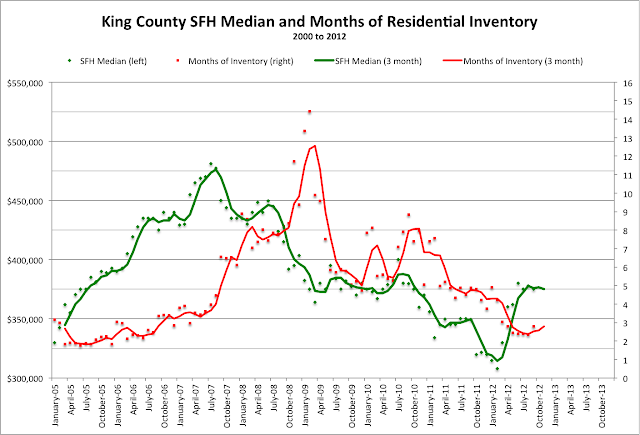 When inventory levels exceed 7 months, then the demand for housing is low, and prices are likely to fall. The high number of homes for sale will create a buyer’s market, allowing buyer’s to dictate price and terms to the majority of sellers if a seller wants to make a deal. When inventory levels fall below 5 months, sellers have more control over price and terms, often resulting in a more significant rise in housing prices, aka a seller’s market. 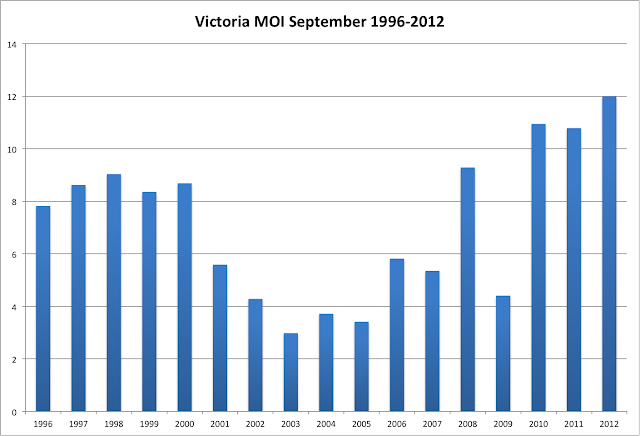 So let's take a look at the last 7 years in Victoria history. 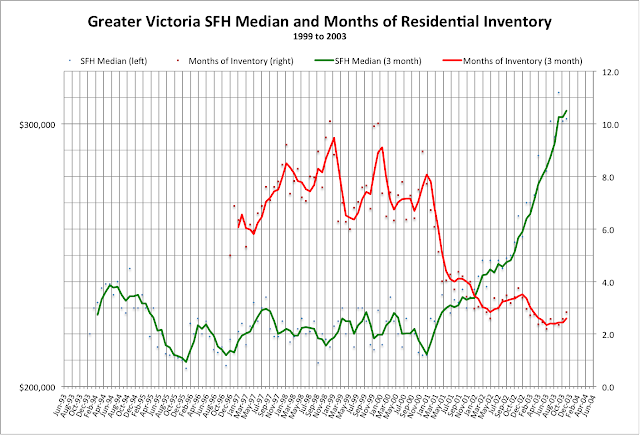 Note that months of inventory is for all residential properties in greater Victoria, including single family homes, condominiums, townhouses, and manufactured homes. Previously I only had monthly data back to mid 2008, but Marko Juras has kindly provided monthly price, new listings, and sales data going back to 1990. Huge thanks for that! Another way to look at the same data is by time. Clearly during the boom times we were in a sellers market with months of inventory going as low as 2 and prices increasing by double digits. 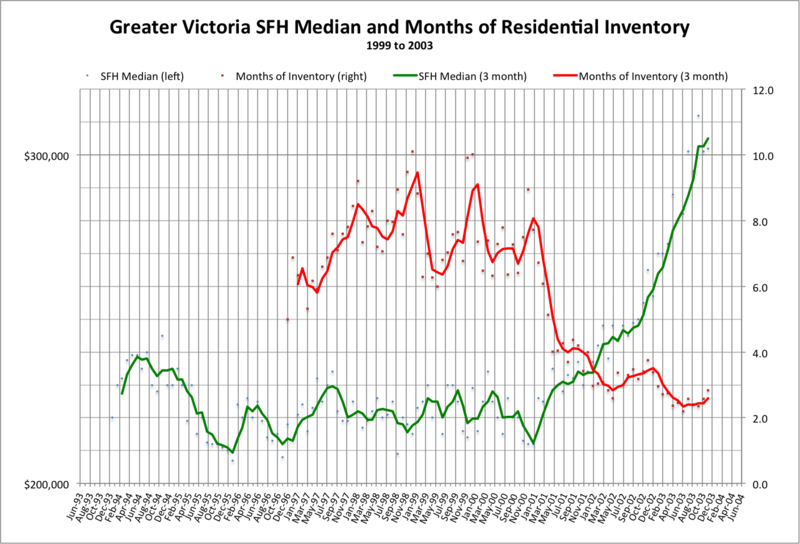 HouseHuntVictoria was founded just as Victoria's market first briefly strayed into balanced territory (Feb 2007, not marked as green) however the boom wasn't done yet, and went on for another year. Fall of 2008 brought the financial crisis and MOI went through the roof causing prices to drop steeply. However the government crashed interest rates and let loose the lending taps to bring the market back to sellers and prices to recover. 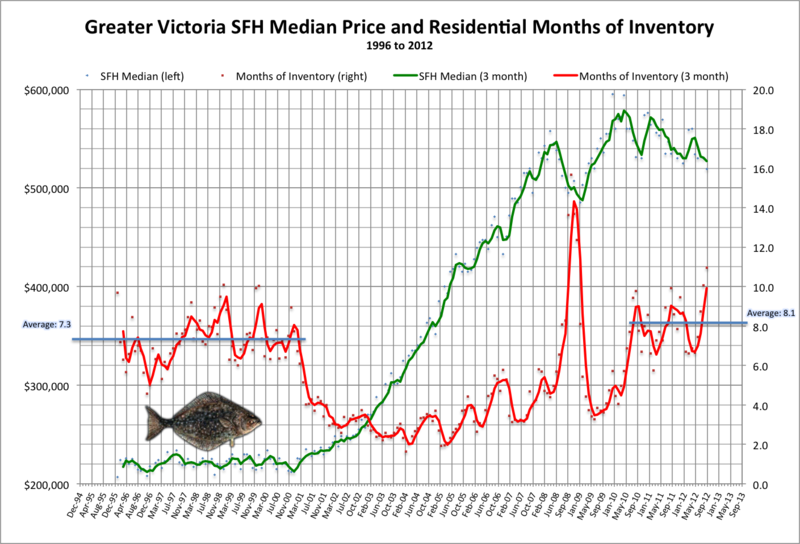 Since 2010 we've been in a buyers market with a gentle decline in prices. What will happen next? It's anyone's guess but notice the steep rise in MOI in the past few months. We are now at the highest level since the financial crisis. Of course the fall will bring some declines here, so another way to look at it is by factoring out seasonal variations and examining the 12 month rolling average of both price and MOI. Next up: What does a market bottom look like? Can it be predicted by the MOI? UPDATE: How odd is 12 months of inventory in September? Very odd. Sales to new listings generally starts low and increases throughout the month, as most of the expired listings are posted again in the first week. October is generally the month that inventory starts to seriously drop for the winter, so it will be interesting to see how the MOI looks at the end of the month. It seems the VREB took my hint of blaming the weather for the slow sales. Well I saw a light drizzle come down today and there's more rain in the forecast, so I expect a big jump in sales going forward. All those sun-burned would-be buyers are about to come out of the woodwork. I don't hold the outgoing Victoria Real Estate Board president accountable for the gaff in this month's market update press release even though it appeared in her voice. I know how these things work and while it's likely she approved the use of the quote it's highly unlikely she was its author. Never-the-less, it was a priceless gem that should live on in infamy so I've added it to the header of this site so we can have a little laugh every time we find ourselves visiting. What a beautiful September we had. So beautiful that I'm surprised the VREB didn't use it as an excuse for the miserable sales. We had a whole 419 sales compared to last year's 458, and 5025 active listings compared to last year's 4940. Nothing earth shattering but just more progression in the market getting weaker and weaker every month. Expect a drop in MOI as places drop off the market quickly in October. The last two years have seen September mark a high point in MOI. Median price is the lowest in over 3 years (July 2009). Months of inventory are the highest since February 2009. It's a sales-free zone out there folks. The only hotbed of activity is the comments section of this blog where we've managed to rack up 60 comments a day this week. Just how slow is it out there? 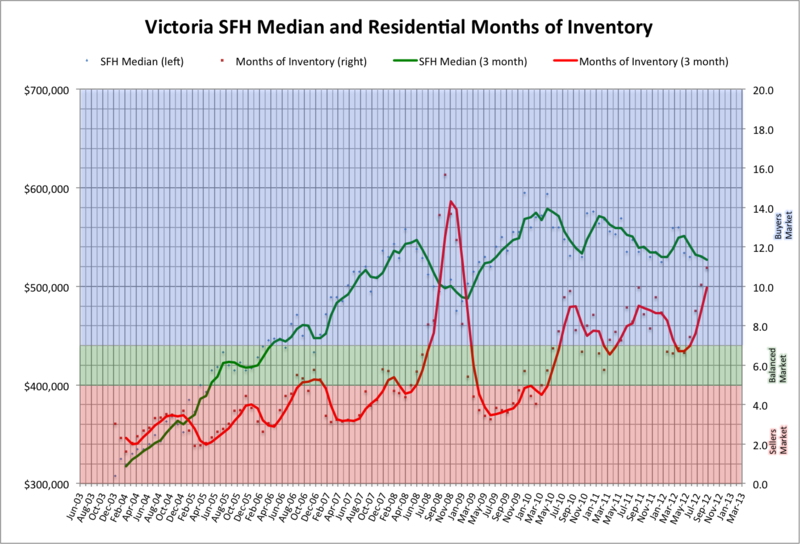 Well last week I saw 12 SFH sales in the core areas under $550k and 17 from there to $900k. So far this week I'm at 3 and 5 respectively. Some more will come of course. Made a lowball offer on a place but after a bit of back and forth we were still miles apart. We're offering 2013 prices and they're still in 2008. Near as makes no difference to 5000 listings out there but there really isn't much that's interesting. The stale listings are showing up as rentals instead on craigslist. Wonder how that vacancy rate is going to look? 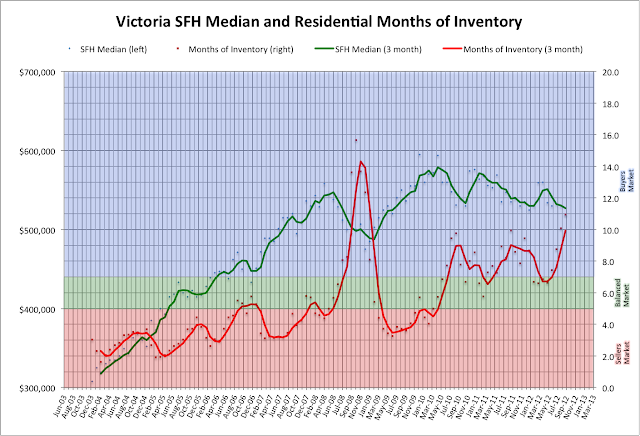 Current SFH average is $618k, with a median of $531k, while condo average is at $331k. Marko says "The SFH MTD Median is subject to quite a bit of variability right now, it could easily swing to 520k with two sales under 515k or up to 538k with two sales above 550k." It's remarkable how consistent the numbers are this year. A few less sales and listings as the same month last year. 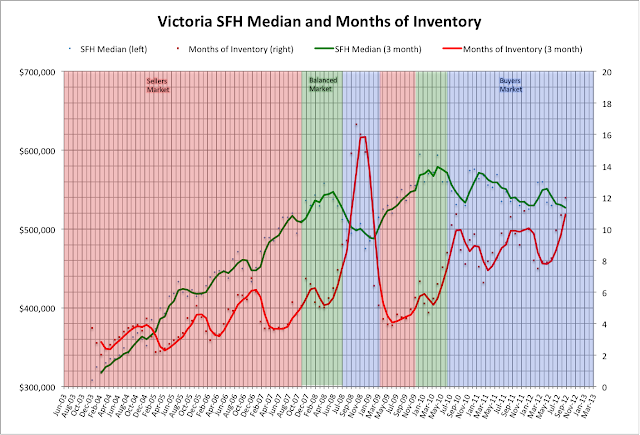 So the inventory isn't increasing anymore YOY, but the months of inventory are still significantly higher. We're shortly before the time when many sellers give up and try their luck again in the spring, although at this point I doubt many still seriously believe a bounce is just around the corner. 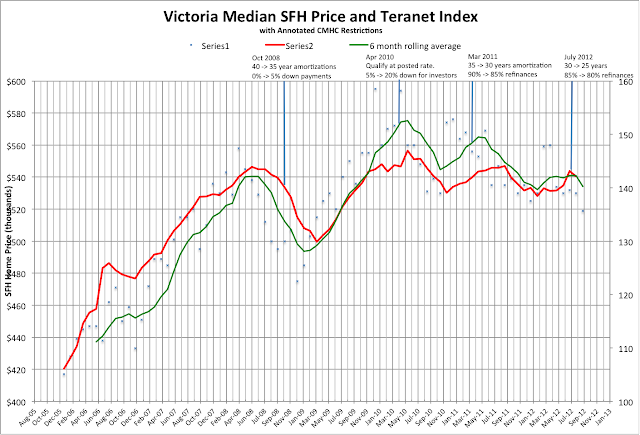 After a near-decade of price inflation in the Victoria real estate market, you could probably forgive sellers for the hard times they must be feeling these days as the weeks go by without a sale and the days without showings outnumber the days with showings by a wider margin. Many Victoria sellers likely believe this period will pass in short order and 'the norm' will return before they start to feel the consequences of their stubborn-ness. Those of us who have followed this market for some time know this phenomena as "catching a falling knife." Seller: It's been 45 days since we put the house up for sale and we haven't seen an offer. Why? Agent: The market is slow all over town right now. There's lots of houses on the market and there aren't very many buyers actively looking to make a purchase. You might want to think about dropping your asking price if you want to invite an offer. Seller: We did that 15 days ago. You told me August was slow and things would pick up in September again so we dropped our asking price by $10,000 to attract some interest. We've had two open houses and a handful of agents walk through. And yet not even a hint of an interested buyer. Our house is worth more than we're asking for it. We've invested almost $10,000 getting it ready to sell and making it the nicest house in the neighbourhood, why no buyer interest? Agent: The market has changed. There are far more homes for sale than buyers actively looking to make offers. Believe me, I'm hearing the same thing from my other clients and I'm hearing other agents telling me their clients are all saying the same things. You have to understand, it's not just about having a nice house anymore that people can move in and enjoy right away. I know that when you bought 7 years ago, you would have faced bidding wars on houses that needed work. That's not normal. That market was too hot to be sustainable. This market is what we call balanced. Which means you have to not only have the nicest house in your area, you also have to have the best price. Right now, we're talking about you finding the best price. Seller: So what does that mean? Are you suggesting we drop the price again? We started at $499,000 now we're at $489,000 and there are less showings than when we were at $499,000. That doesn't tell me the price is wrong. Agent: Do you recall when we first talked about your listing price? We looked at some comparables in the neighbourhood to determine what price your house should be offered for sale at. We had a discussion then about the condition of your house in comparison to your immediate competition. We agreed the money you'd spent on getting your home ready for sale made it nicer than the rest. We agreed this was a good thing and would likely mean that you were more likely to get more for your house than Mr and Mrs Jones the next block over. Seller: We did. We should. Our house is nicer. It's worth more. Agent: Have any of those houses sold yet? They haven't have they? Have they dropped their prices too? They have. You see what I mean? Your house is in nicer condition and you're asking a premium price based on that when you look at the comparables. Seller: Of course we are. It's worth more. Agent: I think we should price it the same as the Jone's house around the corner and see if we can invite more viewings that way and maybe entice an offer. Seller: Are you suggesting we drop our price over $40,000 from the original? That's crazy, we may as well give it away. Agent: If we price it the same, you'll have the best house at the same price. If you were shopping around for a new car, and saw a BMW for the same price as a Toyota, would you hesitate to look at the BMW and maybe even buy it? Seller: We can buy a BMW with that $40,000 you're suggesting we just give away. Agent: You're moving right? You've already made that commitment. What are your options? Can you afford to buy your new house if this one hasn't sold? Can you afford to wait to move until this house sells at the price you think it should sell for? I have to tell you, I don't see prices going up anytime soon. They haven't really been going up for a couple of years now. So if your price that you think your house should be at is already too high, when do you see the market bringing you that price? Seller: You tell me, you're supposed to be the expert. Agent: I'm telling you now. The market doesn't agree that you have a $500,000 home. The market might bear $460,000, but we won't know until we try. Seller: If we drop the price $40,000 in only 45 days we'll be inviting low ball offers. We don't want a low ball offer. Agent: Right now you're not getting any offers. A low ball offer is better than no offer and gives us a chance to counter. Once a buyer has made a decision to make an offer, we'll have an opportunity to negotiate. That's a lot better position than you're in today. Agent: That's competition and that's the way the market works. Hopefully you'll get a buyer soon. But you'll need to be prepared to adapt to the changing conditions in the market if you really want to sell your home .